Greece was in mourning on Tuesday (24 July) following some of the worst wildfires this century, with fears the toll — at least 74 dead and 187 injured so far — could rise, as rescuers search for people trapped in their homes or burned-out cars. The fires, which broke out on Monday afternoon, devoured homes and forests, forcing terrified residents to flea into the sea for safety, while pine forests were reduced to ash and charred cars lined the smoke-filled streets of seaside towns near Athens. “Today, Greece is in mourning,” said Prime Minister Alexis Tsipras, who cut short a visit to Bosnia and announced three days of national mourning. Greek media described the disaster as a “national tragedy”. The government has not yet said how many people were regarded as missing. But the death toll could surpass that from the blazes which hit Greece’s southern island of Evia in 2007 in which 77 people perished. Out of a total 187 people hospitalised, 82 including almost a dozen children were still being treated on Tuesday evening, 10 of whom were in “serious condition”, the fire services said. One Belgian was among the victims, said Belgium’s foreign minister Didier Reynders, while in Warsaw Poland’s government said a Polish woman and her son also died. Dozens of people were overtaken by the flames in their homes, on foot or in their cars. AFP photographers saw the burnt bodies of humans and dogs. The charred bodies of 26 people, including small children, were discovered at a villa at the seaside resort of Mati, 40 kilometres northeast of Athens, said rescuer Vassilis Andriopoulos. They were huddled together in small groups, “perhaps families, friends or strangers, entwined in a last attempt to protect themselves as they tried to reach the sea”, he said. As world leaders including Pope Francis affirmed their solidarity, Athens said 308 engineers will arrive on site by Wednesday to assess the damage. But “the problem is what is still hidden under the ashes,” said Vice President of Emergency Services Miltiadis Mylonas. Dramatic video footage showed people fleeing by car as the tourist-friendly Attica region declared a state of emergency. “I saw the fire move down the hill at around 6:00 pm and five or ten minutes later it was in my garden,” said 60-year-old Athanasia Oktapodi. Her home is surrounded by dry pine trees. Fire service spokeswoman Stavroula Maliri said firefighters were still searching for more victims and taking “dozens of calls” from people looking for relatives, she said. Winds of above 100 kilometres per hour (60 mph) in Mati caused a “sudden progression of fire” through the village, said Maliri. “Mati no longer exists,” said the mayor of nearby Rafina, Evangelos Bournous, adding that more than a thousand buildings and 300 cars had been damaged. “I saw the flames outside the window of our hotel. I thought it would explode,” said Alina Marzin, a 20-year-old German tourist who had been staying at the Capo Verde hotel in Mati on Monday evening with her brother and their parents. At least six people died trying to escape the flames into the sea. Some 715 people were evacuated by boats to Rafina, the government said. “People are shocked, lost. Some of them have lost everything: children, parents, homes,” said Red Cross spokeswoman Georgia Trisbioti. The European Union activated its Civil Protection Mechanism after Greece sought help. 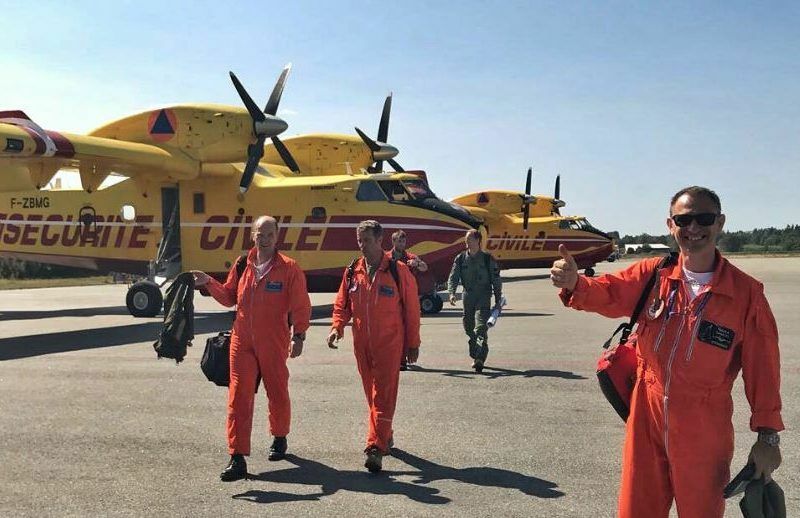 Several countries said they were sending aircraft to help fight the flames. European Commission chief Jean-Claude Juncker tweeted the EU “will spare no effort to help Greece and the Greek people”, while Pope Francis spoke of his “deep sadness,” sentiments echoed by EU and NATO leaders. NATO head Jens Stoltenberg offered the alliance’s full solidarity with Greece, whose government earmarked financial aid for victims’ relatives. Critics say that the EU is to blame for the tragedy, as the austerity package imposed on Greece required cuts in the budget of its fire services. Meanwhile, Supreme Court prosecutor Xeni Dimitriou ordered a probe into the causes of the blazes amid indications that the state response to the emergency had been slow and that no evacuation plan for such a situation had been in place, Kathimerini announced. Interior Minister Panos Skourletis said the priority was to extinguish a fire still burning in Kineta, 50 kilometers from Athens. Near the town of Marathon, residents fled to safety along the beach, while 600 children were evacuated from holiday camps. Officials raised the possibility the blazes could have been started deliberately by criminals out to ransack abandoned homes. “I am really concerned by the parallel outbreak of these fires,” Tsipras said as supreme court prosecutors announced they had opened an investigation into the causes of the fire. Showers were set to see temperatures around Athens drop slightly after hitting 40 degrees Celsius (104 degrees Fahrenheit). Wildfires have also caused widespread damage in northern Europe in recent days. Sweden, experiencing an unprecedented drought and the highest temperatures in a century, has counted more than 20 fires across the country. Fires have also hit Finland’s northernmost Lapland province. Norway, which experienced its hottest May temperatures on record, has seen several small fires. One firefighter was killed on 15 July trying to contain a blaze. Fires have raged for five days in Latvia, destroying more than 1,000 hectares in the Baltic state.